Back in September, I posted some comments about Paul Levitz leaving the President/Publisher chair at DC Comics and returning to writing. I mentioned in that entry that I remembered a text piece at DC—a “DC Profile” or “Meet the Staff” or some other such feature—where Paul was quoted as saying that he wouldn’t be making comics his lifelong career, but was enjoying working in the field while he was in college. And that it was to all our benefits that his plans changed. 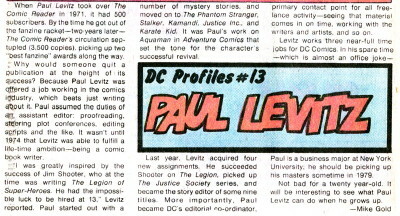 Since then, a few people have e-mailed me, telling me where I could find the 1977 “DC Profiles” entry on Paul. Glen Cadigan even sent along a handy link to where it could be seen online, and for those of you who can’t (or don’t want to try to) make out what it says above, you can see it here: DC Profiles #13. But while I thank you all, I have to note: That’s not the one I meant. That is, indeed, the “DC Profiles” entry on Paul, but it’s not the text piece where he says he’s not planning to make comics his career. So the one I’m remembering is from somewhere else. Others—and I apologize for not saving your names—have suggested in appeared in an issue of Amazing World of DC Comics, which is faintly possible, though I only ever read one or two of those. So if it’s in the one with the “Golden Age” cover by Marshall Rogers, could be—but that’s deep in the morass of the Basement of Comics That’s Long Overdue for Organizing and the Great Cull (I mean, am I ever likely to need full sets of Blackwulf and Nightwatch? ), and I won’t be finding it any time soon. Dougie Clark tells me he has a vague memory of it appearing in Stalker #1, but that, too, is somewhere in the BOCTLOFOATGC, and, like that issue of Amazing Word, isn’t in the mostly-kinda-sorta-organized part. A couple of e-mails have suggested that it was in an interview in The Comics Reader or The Buyers’ Guide, but I don’t think so—the reason I remember it is that I ran across it at some point after it was quite clear that Paul was in comics for the long haul, and that’s why it stood out as memorable. So for now, at least, it remains a mystery. But thanks to all who’ve made suggestions, and if anyone out there has Stalker #1 in a readily-findable location, take a look and let me know, okay? RB: Had it been your plan, while doing TCR, to try to get into the industry or was it just something that happened along? PL: It occurred to me while doing TCR that the industry would be a nice place to work my way through college. It still basically is that to me. The process is taking a lot longer than i ever counted on because since Carmine’s leaving DC, of course, my role in the industry has changed so much and the proportion of time devoted to college and work has sort of reversed. But I’m still going on with the education, and I still hope to be out of the business within a few years. That’s the sentiment I remembered, but I’m not sure that’s the place I saw it. Still, nice to know I wasn’t completely hallucinating! This entry was posted in Uncategorized and tagged paul levitz by Kurt Busiek. Bookmark the permalink.